Large quantities of plastic debris are building up in the Mediterranean Sea, say scientists. A survey found around one thousand tonnes of plastic floating on the surface, mainly fragments of bottles, bags and wrappings. The Mediterranean Sea's biological richness and economic importance means plastic pollution is particularly hazardous, say Spanish researchers. Plastic has been found in the stomachs of fish, birds, turtles and whales. 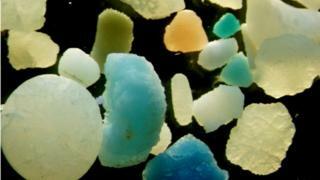 Very tiny pieces of plastic have also been found in oysters and mussels grown on the coasts of northern Europe. "We identify the Mediterranean Sea as a great accumulation zone of plastic debris," said Andres Cozar of the University of Cadiz in Puerto Real, Spain, and colleagues. "Marine plastic pollution has spread to become a problem of planetary scale after only half a century of widespread use of plastic materials, calling for urgent management strategies to address this problem." Plastic is accumulating in the Mediterranean Sea at a similar scale to that in oceanic gyres, the rotating ocean currents in the Indian Ocean, North Atlantic, North Pacific, South Atlantic and South Pacific, the study found. A high abundance of plastic has also been found in other seas, including the Bay of Bengal, South China Sea and Barents Sea in the Arctic Ocean. Commenting on the study, published in the journal PLOS ONE, Dr David Morritt of Royal Holloway, University of London, said scientists were particularly concerned about very small pieces of plastic (less than 5mm in length), known as microplastics. The study found more than 80% of plastic items in the Mediterranean Sea fell into this category. "These very small plastic fragments lend themselves to being swallowed by marine species, potentially releasing chemicals into the gut from the plastics," Dr Morritt, of the School of Biological Sciences, told BBC News. "Plastic doesn't degrade in the environment - we need to think much more carefully about how we dispose of it, recycle it, and reduce our use of it." The Mediterranean Sea represents less than 1% of the global ocean area, but is important in economic and ecological terms. It contains between 4% and 18% of all marine species, and provides tourism and fishing income for Mediterranean countries. "Given the biological wealth and concentration of economic activities in the Mediterranean Sea, the effects of plastic pollution on marine and human life could be particularly relevant in this plastic accumulation zone," said Dr Cozar.